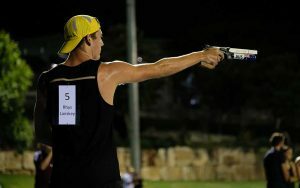 On the 10th of March 17-year-old Rhys Lanskey won the Australian senior modern pentathlon title in commanding fashion at his home-city of Brisbane. Rather than kick back for a few weeks and enjoy the breakthrough win, he met with his coaches the morning after his dominating win to establish the next set of plans for the talented athlete. “All of my coaches were there on the day, which is unusual because having five sports and competitions generally not in Brisbane it’s hard for them to see me compete,” Lanskey said. “For some of them it was the first Modern Pentathlon competition they had seen live, so it was fantastic to share such a great result with them. “After the initial excitement of winning the open event and getting the qualifying time I was after to be able to compete in China, I met with my coaches and management from QAS the next morning. Rhys Lanskey celebrates a great swim at the 2019 Modern Pentathlon Nationals. He did have a lighter week of training post the win before returning to full training of up to 15 sessions a week. His Australian Championships’ performance included a best time in the pool, a solid day on the fencing piste and a clear round of show jumping before his brilliant run-shoot. But he knows there is no escaping the hard work to become internationally competitive in fencing and continue to improve in the other disciplines. “My first goal for 2019 is to get stuck into my training because I only finished Year 12 last year and started full time training with the Queensland Academy of Sport after graduation,” Lanskey, who is relishing the ‘amazing opportunity’ at the QAS said. “I’m pretty new to Modern Pentathlon so I actually really enjoy and look forward to training and learning more about my sport. 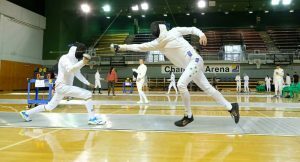 Rhys Lanskey fencing at the 2019 Modern Pentathlon Nationals. “I’ll be competing in the Junior World Championships in Poland and the Under 19 Youth Championships in Bulgaria July. Lanskey is aiming to be on the start line in China with Rio Olympian Max Esposito, who missed Nationals due to injury. 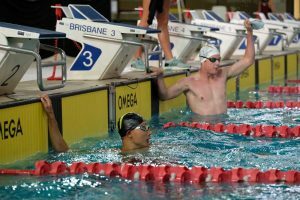 The top placed finisher from Oceania at the qualifier in November will achieve Olympic qualification for Tokyo in 2020. 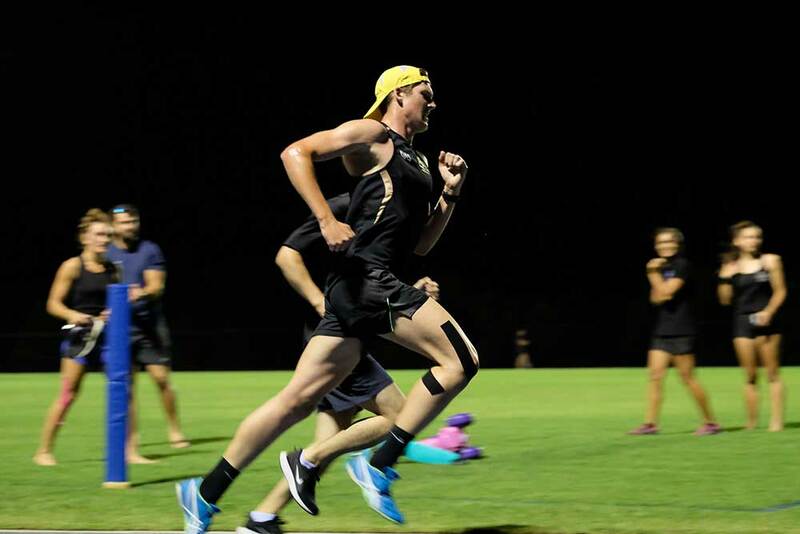 Rhys Lanskey during the Laser Run at the 2019 Nationals. When he is not training, or working on the family property, or studying for his Associate Degree in Business at the University of Queensland he ‘hangs out with my friend and go for a ride on my Campdrafting horse ‘Limo’. Lanskey is dedicated and has plenty of talent. He knows the hard work now will give him the best chance of success overseas in 2019.